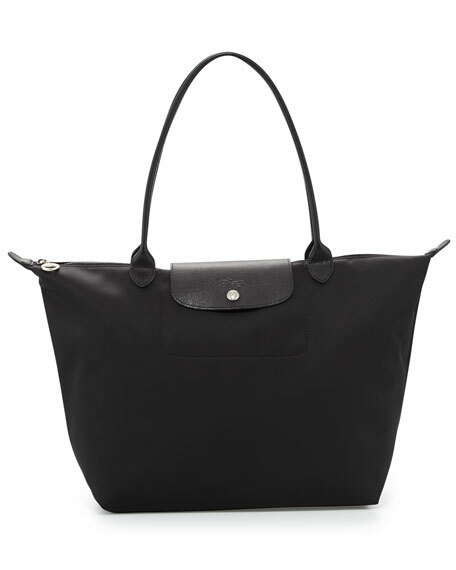 Longchamp nylon tote with tonal leather trim. Rolled top handles, 8.5" drop. 11.8"H x 12.3"W x 7.5"D.
"Le Pliage Néo" is imported. kate spade new york light-wash denim and leather tote bag with silvertone hardware. Flat top handles, 10" drop. Open top with self-tie strap closure. Exterior, frayed trim; spade logo stud, two front slip pockets. Interior, one zip pouch. 11"H x 15"W x 6"D.